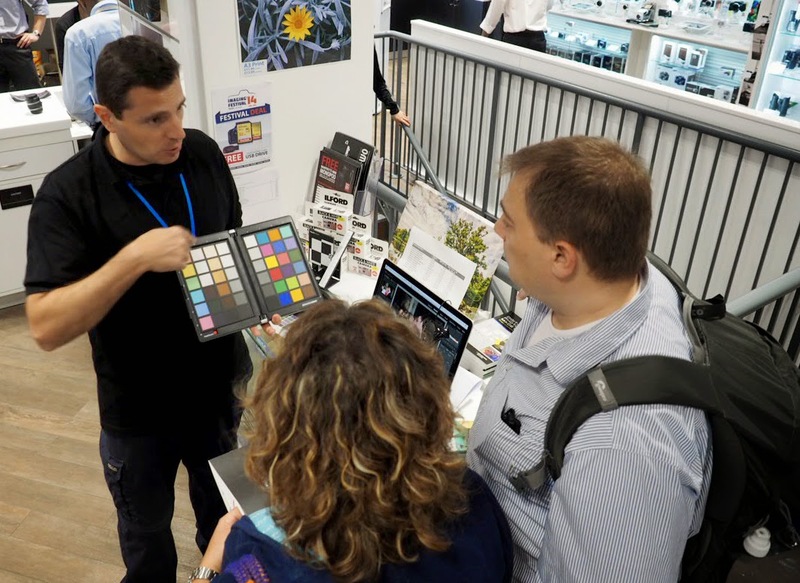 Further to his appearance at the Park Cameras Summer Imaging Festival held in June 2014 and as video becomes more a part of our everyday lives as photographers, Richard West from Datacolor writes here about one of the hot topics from the show - calibration for stills photography and videography. If you've ever had the problem of shooting the same subjects over the period of a day using multiple cameras and in varying lighting conditions but yet still have to arrive at a consistent end result, the guys at Datacolor may have just saved you a lot of time and heartache. Never more obvious than when shooting Weddings where the bride and groom can lead you through the joys of shooting in a poorly lit church with a range of stained-glass diffused lighting, candles and in the worse cases... bar heaters! The group scenes invariably involve decamping to the outside and whatever natural light is available and then finally the inside shots for the reception deliver you into yet another lighting set up with a possible coup de grâce of an evening disco to complete the lighting extravaganza. If you are using multiple cameras and also shooting video across the same range of conditions then you really are giving yourself a potential nightmare for making sure everyone looks equally tanned in all shots and it doesn't look as if the bride has had four changes of gown as she appears to be in ivory in one set of shots and beige in another etc. With so many variables it’d be nice to have an easy way to set some control over what you’re doing, allowing you to match different cameras, deliver a neutral white point for shots (where need¬ed) and control your contrast across your entire shoot. Fortunately new to the market is Datacolor’s SpyderHD. This clever bundle of invaluable elements puts you in the driving positioning. Fortunately new to the market is Datacolor’sSpyderHD. This clever bundle of invaluable elements puts you in the driving position from the first shot of the day to the last viewing of the end stills and video. First off the shiny metal carry-cased Spyder HD delivers the perfect portable device for setting white and grey points for stills and videos. The SpyderCUBE is a highly pocketable version of a grey card but avoids you having to worry about it becoming creased, stained and worthless when compared to conventional foldable cloth or paper cards. This little gem, as the name suggests, is cubic in shape and only about 4cm (about an inch) in length per side and allows you to balance contrast for your shot like no other solution on the market. Despite its compact nature the SpyderCUBE gives you larger blocks of grey to use as targets than most conventional cards, with two of the cube’s faces split between a 96% White and an 18% grey triangle. Provided you can see both of these two-toned sides when the cube is either hung or tripod mounted into your shoots, you have a perfect target to set grey balance irrespective of the direction of any lighting or even if it’s changing. Once you've shot the SpydrCUBE simply choose the lighter one of these split sides to use in setting the grey balance and then use the black face and white quarters to set your highlights to the 96% white and shadows to a 4% black. Any out of gamut scintillation (100% white and over) or 100% shadows should only appear on the ball atop the Cube or in the hole at the center of the black face respectively. The pocketabillity of the SpyderCUBE means it should always be available to shoot and doesn't require a major feat of positioning first to get the angle correct as conventional cards would do. Simply pull it out of its bag, hang it in the scene or use a mini-tripod, shoot and away you go. When you need to do more than simply set white balance and control contrast for your shots but in¬stead control all the colours across your shoot’s spectrum, allowing you to get that dress, skin tones and any other important hues just right, then the SpyderCUBE’s big brother the SpyderCHECKR comes in to its own. This multi-coloured target comes in a highly robust plastic case about the same shape and size as a tablet computer. Intentionally not as pocketable as the SpyderCUBE its fold-out design is ideal for shooting from a distance and in particular for group scenes. Tripod mountable or simply held or leant into your location at some point in the shoot, the SpyderCHECKR comes with plugin software for most image capture solutions (e.g. Adobe Photoshop Lightroom, Adobe Photoshop or Hasselblad Phocus) and enables you to set up a calibration preset with the touch of a button to linearise all your shots. As the software knows what each colour swatch should be it can instantly calculate a calibration across the spectrum to remove casts and bring all colours into alignment in virtually any lighting condition. 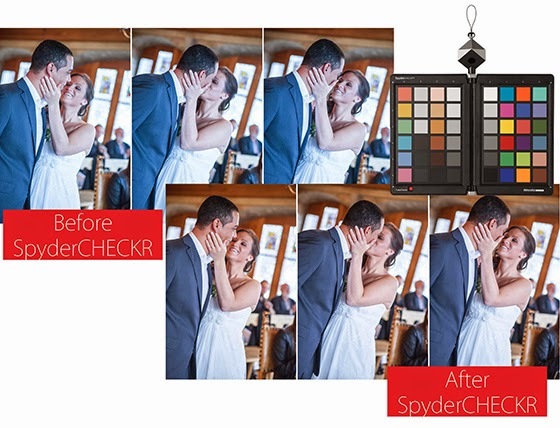 Don’t worry though, you don’t need to ask your brides, grooms or models to hold the SpyderCHECKR - as long as you shoot the target at some point in the same lighting conditions that any group of shots is taken in, you can apply the calibration to the whole group later on. Once you’ve gone to the trouble of removing colour casts and linearising all your images to appear to be in the same lighting conditions you’d be rather defeating the object if you now start retouching and adjusting colours on a non-colour managed screen. 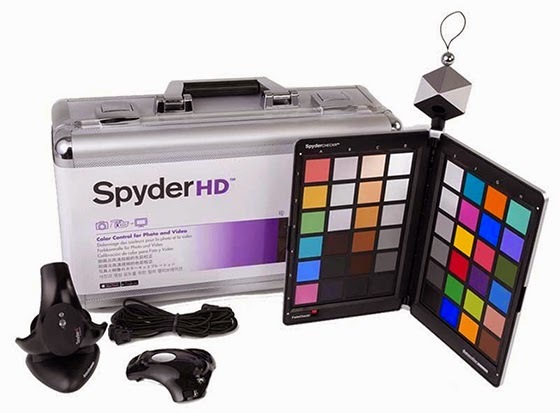 Fittingly the SpyderHD comes with the latest top of the range SpyderELITE HD screen calibrator as part of the system. This ultra-accurate device simply plugs into your computers’ USB sockets and allows you to calibrate connected screens by running the easy to use Mac or PC software. Once run, you can retouch your images safe in the knowledge that ‘What you see is what you get’ at least as far as colour is concerned. Working with soft proofing profiles from your print houses or output devices then puts you in control to see how your images will output on virtually any combination of paper, ink and printer. Ignoring how your images may be printed, frequently the most critical environment (certainly for any Wedding Photographer) is the final viewing with the clients. If what appears on screen doesn’t tally with expectations you’ve a lot of back-tracking and persuasion ahead of you. Having already used the SpyderELITE HD within the kit to calibrate your retouching screens you can feel assured that colours here will look spot on but courtesy of the accompanying SpyderWEB holster and calibration DVDs or Blu-ray discs you can now also calibrate the largest of TV or Video playback displays to make sure your stills and video colours match superbly as well. Finally download the free SpyderGALLERY App from either the iTunes App Store or Google Play and you can calibrate your iOS and Android tablets and phones to give you a mobile gallery viewer that also matches. So it really is just one stop to get your Pictures looking perfect. The manager here tells you how it is and is open and honest to guarantee your event is flawless, and you leave floating on air because you're so blissfully happy!